The need for space has helped us come up with portable offices. The new type of buildings is cheaper to construct and takes less time making it convenient. Having a portable space that is made from durable material is a great advantage for your business. If the space in your office is not enough for all your employees investing in a portable office is the best way to go. The interior and exterior designs of the prefabricated building are designed depending on your needs. Despite the cheap tag and reduced building time we follow the same codes and standards as any other conventional building. We guarantee our customers a stable and sturdy structure for less. Portable offices are built to perfection from the structure design to space used. Investing in portable prebuilt portable building office will be a big money saver for your business. In fact a movable portable office is cheap, secure and takes half the time to construct. Well constructed and designed is well structured and will not disappoint you in any way. Environmentally the newly built portable office is 100% re usable, it is eco friendly. The best part about investing in a portable office is the ease of movement, moving a whole business to another location takes longer to settle. 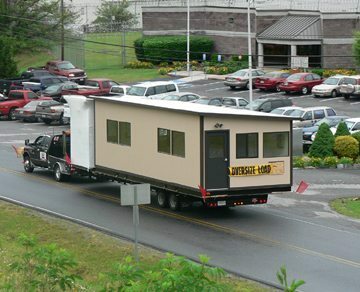 With our prefabricated portable building you take down the building and move it to your desired location. If you want to rent it out you can easily find cheap pre built portable offices available for lease at lower prices. In a world where cutting costs is so important portable buildings are gaining popularity each day. With the ease that comes with erecting a building residential and commercial all purpose buildings. We have a variety of portable building designs that work in both settings. Depending on the functionality or intended use of the building we recommend portable buildings for all situations. Investing in a portable building can be placed either as a permanent structure or temporary structure. If you are planning on setting it up as permanent structure it can still serve you the same purpose as other buildings. We make it our business to understand which size and type of set up required for functionality and ease of use. Although portable buildings are not a new thing in the market, new high quality designs and constructions have changed the outlook. More people are investing on portable buildings and saving much more money by renting out these spaces. They have created a unique and quickly improving the way buildings are designed. As a company we understand that certain projects can only be done outside the office building. Investing in portable office building will help you achieve your business goals. Time– erecting a portable building takes less time than constructing a more permanent structure. It reduces the time and money spent for the whole project. Portable building panel kits can easily be deconstructed and moved to another location. Cost effective: – unlike permanent buildings that need a workforce to finish the project. Temporary building structures use few people to work on the project. It makes it efficient and saves you later on increasing your return on investment. Our designs are made to increase efficiency of portable buildings for functionality. High quality: – we use highly durable materials that make the structure strong. We use high quality materials to provide a safe and functional portable building following the building codes and standards. Our high quality materials are not easily damaged as you make the move to another location. Eco-friendly construction: – portable office buildings are eco friendly with reduced waste in materials. All the materials are premeasured reducing the time used for construction. With less environmental pollution due to cut down of transportation. They are also energy efficient, they cool and heat quickly so you spend less on other areas. Flexibility: – portable building can easily be deconstructed and designed depending on your requirements. With portable buildings they are constructed or made to be relocated to almost all situations. We have a variety of size, types and styles that suit your space needs. We have single and double rooms depending on the storage space and functionality that allows you to customize your portable building. Return on investment- with the cheap cost of construction and design our high quality portable buildings allow for completion of project faster. It saves you money while creating more profit over a short period of time. At panel built we have a number on cheap pre-built portable building offices available. If you are looking at where to find portable buildings look through our site for more information. As they continue to grow in popularity we have the best portable panel kits online that fit your needs and requirements. We give you the option of finding portable building on sale at our site or newly constructed models. Depending on the functionality where to buy cheap portable offices online is an easy run through of our site. At panel built we work to deliver high quality portable offices, functional and spacious enough to fit your project. If you are looking to construct contact us for recommendations, consultations and construction of your next portable building. Contact us for more information on portable buildings.